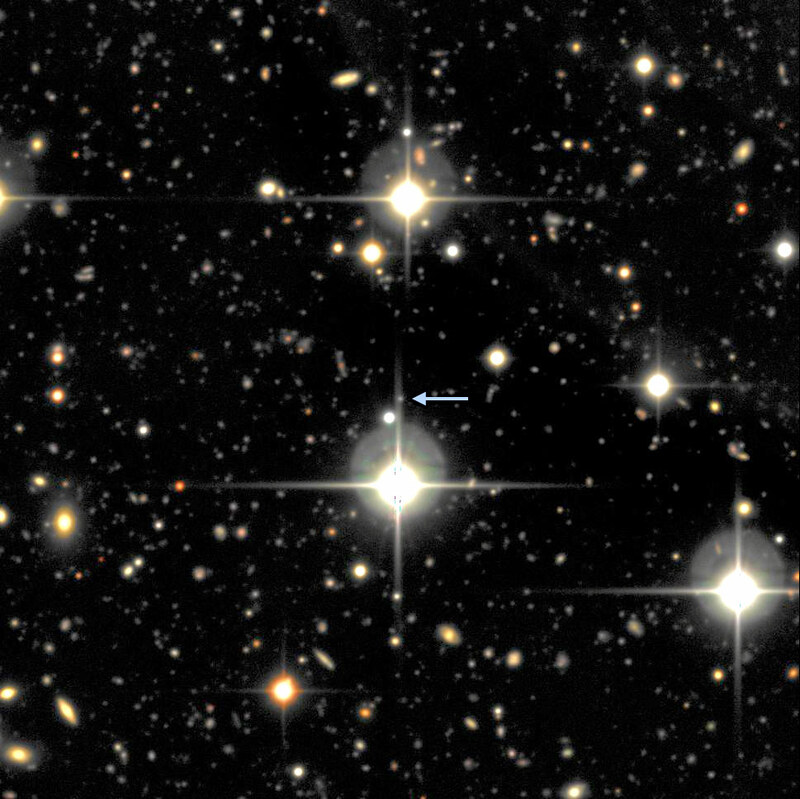 A small portion of one of the fields from the Supernova Legacy Survey showing SNLS-06D4eu and its host galaxy (arrow). The supernova and its host galaxy are so far away that both are a tiny point of light that cannot be clearly differentiated in this image. The large, bright objects with spikes are stars in our own galaxy. Every other point of light is a distant galaxy. In a new study, researchers show that two of the brightest and most distant supernovae ever discovered (SNLS 06D4eu and SNLS 07D2bv) are likely powered by the creation of a magnetar. Astronomers affiliated with the Supernova Legacy Survey (SNLS) have discovered two of the brightest and most distant supernovae ever recorded, 10 billion light-years away and a hundred times more luminous than a normal supernova. Their findings appear in the December 20 issue of the Astrophysical Journal. These newly discovered supernovae are especially puzzling because the mechanism that powers most of them — the collapse of a giant star to a black hole or normal neutron star — cannot explain their extreme luminosity. Discovered in 2006 and 2007, the supernovae were so unusual that astronomers initially could not figure out what they were or even determine their distances from Earth. One of the newly discovered supernovae, named SNLS-06D4eu, is the most distant and possibly the most luminous member of an emerging class of explosions called superluminous supernovae. These new discoveries belong to a special subclass of superluminous supernovae that have no hydrogen. The new study finds that the supernovae are likely powered by the creation of a magnetar, an extraordinarily magnetized neutron star spinning hundreds of times per second. Magnetars have the mass of the sun packed into a star the size of a city and have magnetic fields a hundred trillion times that of the Earth. While a handful of these superluminous supernovae have been seen since they were first announced in 2009, and the creation of a magnetar had been postulated as a possible energy source, the work of Howell and his colleagues is the first to match detailed observations to models of what such an explosion might look like. Co-author Daniel Kasen from UC Berkeley and Lawrence Berkeley National Lab created models of the supernova that explained the data as the explosion of a star only a few times the size of the sun and rich in carbon and oxygen. The star likely was initially much bigger but apparently shed its outer layers long before exploding, leaving only a smallish, naked core. Discovered as part of the SNLS — a five-year program based on observations at the Canada-France-Hawaii Telescope, the Very Large Telescope (VLT) and the Gemini and Keck telescopes to study thousands of supernovae — the two supernovae could not initially be properly identified nor could their exact locations be determined. It took subsequent observations of the faint host galaxy with the VLT in Chile for astronomers to determine the distance and energy of the explosions. Years of subsequent theoretical work were required to figure out how such an astounding energy could be produced. The supernovae are so far away that the ultraviolet (UV) light emitted in the explosion was stretched out by the expansion of the universe until it was redshifted (increased in wavelength) into the part of the spectrum our eyes and telescopes on Earth can see. This explains why the astronomers were initially baffled by the observations; they had never seen a supernova so far into the UV before. This gave them a rare glimpse into the inner workings of these supernovae. Superluminous supernovae are so hot that the peak of their light output is in the UV part of the spectrum. But because UV light is blocked by the Earth’s atmosphere, it had never been fully observed before. Such superluminous supernovae are rare, occurring perhaps once for every 10,000 normal supernovae. They seem to explode preferentially in more primitive galaxies — those with smaller quantities of elements heavier than hydrogen or helium — which were more common in the early universe. Be the first to comment on "Study Shows Superluminous Supernovae are Powered by Magnetars"